Beverly Jenkins discusses Bring on the Blessings. Night Song is Beverly Jenkins' first published novel. She grew up in Detroit, and began her writing career in the fourth grade, as editor of the school newspaper at Jones Elementary. She lives with her husband and two children in Michigan. Her passion for romance and African-American history has her at work on her next historical romance for Avon Books. Beverly Jenkins's book Second Time Sweeter is currently available from LibraryThing Early Reviewers. Beverly Jenkins's book Chasing Down a Dream was available from LibraryThing Early Reviewers. Beverly Jenkins's book Stepping to a New Day was available from LibraryThing Early Reviewers. Beverly Jenkins's book For Your Love was available from LibraryThing Early Reviewers. Beverly Jenkins's book A Second Helping was available from LibraryThing Early Reviewers. Beverly Jenkins's book Bring on the Blessings was available from LibraryThing Early Reviewers. 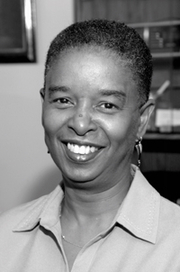 Beverly Jenkins is currently considered a "single author." If one or more works are by a distinct, homonymous authors, go ahead and split the author. Beverly Jenkins is composed of 3 names. You can examine and separate out names.